Filed to: Is this all you got?Filed to: Is this all you got? 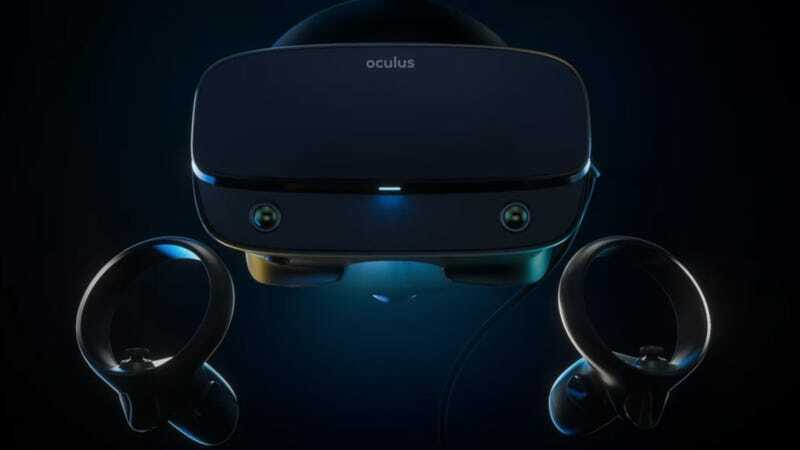 Between the departure of former CEO Brendan Iribe and Oculus’ recent focus on standalone VR headsets like the Oculus Go and the forthcoming Oculus Quest, it sort of felt like the company’s PC roots were being left behind. But Oculus promised it was working on a successor to the original Rift from 2016, so here it is: the Oculus Rift S. And it’s sort of underwhelming. I’m not saying the Rift S isn’t an upgrade over its three-year-old counterpart. But compared to a lot of other tethered VR headsets, it feels like Oculus could have done more. Compared to the 2160 x 1200 resolution on the original Rift, the S features a new 2560 x 1440 LCD screen. However, compared to headsets like the Vive Pro or the HP Reverb which sport per eye resolutions of 1440 x 1600 and 2160 x 2160 respectively, the Rift S’ per eye resolution of 1280 x 1440 falls a bit short. Additionally, the new screen on the Rift S also features a slightly lower 80Hz refresh rate than the 90Hz screen used on the original Rift. Now it’s possible that a difference of 10Hz might not make a huge difference, but a higher refresh rate is one method VR headset makers use to reduce potential motion sickness, which means people more susceptible to VR-induced nausea could run into issues when using the Rift S. It’s unclear why Oculus decided to go this route, but it’s possible the designers just think they can get away with it and cut costs. Thankfully, like the Oculus Go, the Rift S comes with a new type of lens that helps reduce the flared “god rays” that was often an issue on Oculus’ first-gen headset. And thanks to some help from Lenovo, Oculus claims the Rift S will be more comfortable as well, due to improved weight distribution, better light blocking, and a redesigned Halo headband similar to what you get on the PSVR and HP Reverb. The Rift S also sports built-in audio using speakers integrated into the headset, though if you want, you can still hook up your own headphones using the headset’s included 3.5mm jack. One thing you won’t find on the Rift S though is a dial to adjust interpupillary distance, as Oculus has opted to let users tweak the headset’s optics in software. But the Rift S’s biggest upgrade is the inclusion of five cameras built into the headset: two in front, one on either side, and one up top. That means you won’t need Oculus’ $60 sensors anymore to achieve room-scale VR, as the headset will be able to track your movements by looking at the room directly. Those cameras also help power what Oculus calls its Passthrough+ tech, which lets you use the cameras to see the outside world in “stereo-correct” computer vision inside the headset. While what you see will only be in black and white, Passthrough+ offers the added benefit of letting you see the outside world anytime it senses you are about to go out of bounds, so you don’t bump into a wall. Or you can just use the feature to see and then grab a drink between levels of your favorite VR game. And despite the Rift S using a different solution for tracking your surroundings, Oculus says the Rift S shares the same core platform experience and will be able to play and access all the same games as the original Rift, both now and in the future. Here are the Rift S’ minimum and recommended specs per the Oculus website. What’s a bit perplexing is that most of these improvements are centered around convenience, which is nice. But, these upgrades don’t really add any new features to Oculus’ VR capabilities. There’s no eye-tracking or talk of foveated rendering, and the bump in resolution is very modest. And the only change to the controllers was moving the tracking ring slightly so that the cameras on the Rift S could see them better. On the bright side, at $400, the Rift S only costs $50 more than the old Rift. That’s $200 less than the HP Reverb and $400 less than a Vive Pro (and that’s just for the headset sans controllers or lighthouses). So if you’re looking to replace your old Rift or thinking about getting into VR for the first time, the Rift S should be a friendlier option. Hopefully, we’ll know more after we get a chance to check it out in person. Update: We originally stated that the Rift S has an OLED display, when in fact, it uses a fast-switch LCD screen. We regret the error.